As the saying goes, facts are many but the truth is one. The truth is that the U.S. military is the single largest consumer of energy in the world. But as a wise man once said, don't confuse facts with reality. The reality is that even U.S. Department of Defense (DoD) does not know precisely where and how much energy it consumes. This is my Fact Zero. Below I give some facts and figures on U.S. military oil consumption based mostly on official statistics. If you want to reproduce them make sure you read every footnote even if you need to put on your glasses. Also read the footnotes in this article. FACT 1: The DoD’s total primary energy consumption in Fiscal Year 2006 was 1100 trillion Btu. It corresponds to only 1% of total energy consumption in USA. For those of you who think that this is not much then read the next sentence. Nigeria, with a population of more than 140 million, consumes as much energy as the U.S. military. The DoD per capita energy consumption (524 million Btu) is 10 times more than per capita energy consumption in China, or 30 times more than that of Africa. Total final energy consumption (called site delivered energy by DoD) of the DoD was 844 trillion Btu in FY2006. FACT 2: Defense Energy Support Center (DESC) sold $13 billion of energy to DoD services in FY2006. More than half of it was to Air Force. FACT 3: Oil accounts for more than three-fourths of DoD’s total site delivered energy consumption. Oil is followed by electricity (slightly more than 10%) and natural gas (nearly 10%). In terms of fuel types, jet fuel (JP-8) accounts for more than 50% of total DoD energy consumption, and nearly 60% of its mobility fuel. 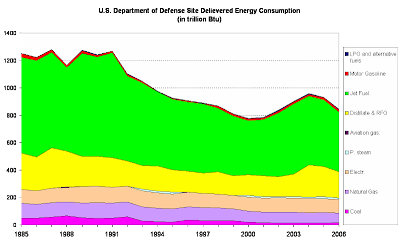 The good news is that between 1985 and 2006, DoD’s total site delivered energy consumption declined more than 60%. The bad is that the reduction came from the decline in energy consumption in buildings and facilities. Vehicle energy consumption went up. The ugly news is that even though the DoD is proud of having reduced its energy consumption, in fact the main factor behind that reduction was the closure of some military bases, privatization of some of its buildings, and leaving some energy related activities to contractors. 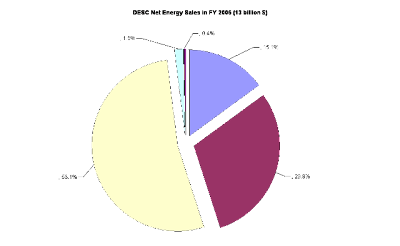 FACT 4: Nearly three quarters of DoD site delivered energy is consumed by vehicles (or for mobility if you like). Only one quarter is consumed in buildings and facilities. And yet all DoD/Federal energy conservation and efficiency efforts, initiatives, directives etc target almost completely buildings (called standard buildings in DoD jargon). Note also that standard buildings account for almost 90% of total buildings and facilities energy consumption. According to the DoD’s Federal Energy Management Report for FY2006, the DoD spent approximately $3.5 billion on facility energy and $16.5 billion on energy for tactical vehicles. To this we should add 238 million spent on non-tactical vehicles. Overall, total actual cost for DoD energy consumption is over $20 billion. By the way, remember that a billion has nine zeros. According to Pentagon spokesman Chris Isleib a $10 increase per barrel of oil increases Defense Department costs by $1.3 billion per year. How about the external costs? According to Milton R. Copulos, President of the National Defense Council Foundation, the fixed costs of defending Persian Gulf oil amounts to $137.8 billion annually. FACT 5: DoD consumed 97 million gasoline gallon equivalent in its non-tactical vehicles and for that it spent 238 million dollars. DoD’s total worldwide non-tactical fleet inventory includes 187,493 vehicles. Of that amount, 13% is located abroad. FACT 6: The U.S. military consumed almost 180 million barrels (or 490 thousand barrels per day) of oil in 1985 worldwide. In 2006, its oil consumption was down to 117 million barrels (or 320 thousand barrels per day), despite increasing activity in Iraq and Afghanistan. FACT 7: If FACT 6 is true, then how can we explain the discrepancy between what DESC sold to DoD and what DoD reported as consumed? More or less, one is sales of oil and the other is consumption of what is delivered. So, the difference is stock changes? If that were the case then where the DoD stocked more than 15 million barrels of oil in 2002, 2003 and 2006? Or maybe some oil consumed overseas is underreported? In 2006, for example, DESC reports in its Factbook that it sold 131 million barrels of oil (or 358 kbd) to DoD but DoD Federal Energy Management Report states that DoD consumed 117 million barrels (or 320 kbd). FACT 8: According to 2007 CIA World Fact Book there are only 35 countries in the world consuming more oil than DoD. Guess how many countries consume more oil per capita than the DoD? Only three. FACT 9: How much oil does the U.S. military consume abroad? There exist no official estimates. Let me know if you see or hear one. According to my most pessimist estimates it is about 150 thousand barrels per day. Note that in this estimate I take DESC sales figures as granted. However, keep in mind that official figures for U.S. military oil consumption do not take into account of unpaid oil. FACT 10: Whatever the true figure oil consumed by the U.S. military does not show up in world oil demand. See for more explanation under item #425 in October 2004 issue of ASPO Newsletter. FACT 11: Since the military’s war machines burns fuel at such intense rates, it becomes impractical to talk about consumption in miles per gallon. That is why fuel use in military applications is shown in "gallons-per-mile," "gallons-per-hour," and "barrels-per-hour." Here are some examples: Flying gas-guzzling bomber B-52 burns about 3300 gallon per hour, flying gas stations KC-135 and KC-10 (aerial refueling tankers) burn on average 2650 and 2070 gallons per hour respectively. Famous F-15 and F-16 fighter aircrafts burn about 1580 and 800 gallons per hour respectively. Armored vehicles have very low fuel efficiency. For instance the Abrams tank can travel less than 0.6 mile per gallon of fuel, and Bradley fighting vehicle less than 2 miles on a gallon of fuel. High Mobility Multi-purpose Wheeled Vehicle (often called Humvee in military circles), which replaced World war II ear Jeep two decades ago, gets as few as 4 miles per gallon in city driving and 8 miles per gallon on the highway. In comparison, Ford's Model T got 25 miles per gallon, and today a Ford Explorer gets 18 miles per gallon. FACT 12: In 2006 Air Force consumed around 2.6 billion gallons of jet-fuel which is the same amount of fuel U.S. airplanes consumed during WWII (between December 1941 and August 1945). FACT 13: American GI is the most energy-consuming soldier ever seen on the field of war. In May 2005 issue of The Atlantic Monthly, Robert Bryce stated that “The Third Army (of General Patton) had about 400,000 men and used about 400,000 gallons of gasoline a day.” This makes one gallon per day per soldier. According to my calculations (based on officially deployed troops number and oil consumption statistics) this amount went up to 9 gallons per day per deployed soldier in Vietnam War, to nearly 10 gallons per day per deployed soldier in Operation Desert Shield/Storm (Gulf War), and to 15 gallons per day per deployed soldier in January 2007. I admit that this kind of calculation is not appropriate since troop levels vary in time. FACT 14: Delivering fuel to consumers is not limited to logistics pains. Of the top 10 battlefield guzzlers in the U.S. Army, only 2 are combat vehicles (the Abrams tank and the Apache helicopter). The other eight carry fuel and supplies. 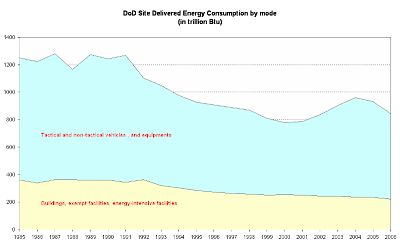 Over half of the fuel transported to the battlefield is consumed by support vehicles, not vehicles engaged in frontline combat. The logistics costs to deliver fuel include people, training, platforms (for example, oilers, trucks, and tanker aircraft), and other hardware and infrastructure. Those costs can be tens and sometimes hundreds of times the cost of the fuel itself, depending on how it is delivered. The Army has 40,000 troops involved in either the distribution or movement of energy. I should state that the fastest growing requirement on the battlefield today is electric power. FACT 15: The Pentagon maybe does not care about the environment, but it’s quietly leading the quest for renewable energy under the banner of finding alternatives to oil. The Navy is studying alternate propulsion systems as well as proposals for an all-nuclear Navy. Nellis Air Force Bace (NV) awarded a contract on July 31, 2006 to build the world’s largest photovoltaic array in the world. The array will be a minimum of 15 MW and provide approximately one third of the base’s power needs. U.S. Nany is operating the largest wind/diesel hybrid plant in the world (guess where? Navy Base in Guantanamo Bay, Cuba) the two largest Federal photovoltaic systems in the United States. Today, almost 9% of the electricity used by military facilities comes from renewable energy sources, and the Pentagon plans to raise that to 25% by 2025. The Air Force is the largest renewable energy power purchaser in the U.S. and third largest in the world. Four Air Force bases rely entirely on renewable energy for power, while several others use a combination of solar, wind and land gas production for power. According to Michael W. Wynne is the Secretary of the Air Force, in 2007 the Air Force is buying 206,000 gallons of synthetic fuel (derived from natural gas) for testing programs. The Air Force aims to acquire 50% of CONUS (continental US) fuel from a synfuel-blend produced domestically by 2016. At current consumption, this equates to some 325 million gallons at a 50/50 blend. Now, multiply that with $20 per gallon which is what the Air Force pays today to Syntroleum, producer of synthetic JP-8. Defense Energy Support Center has been the single largest purchaser of biodiesel (composed of 20% vegetable oil and 80% diesel fuel) in the US. The U.S. Navy is the largest diesel fuel user in the world, at least in 2005. Is it still? Pentagon’s this new environmentalism, however, is not shortsighted and does not much the realities. For instance, all Air Force’s future aircrafts under procurement (F-22 Raptor, F-35 as well as new aerial refueling tanker KC-X etc) run on oil. They will remain in service at least until 2030. There can never be a petroleum free military until 2030. This may sound an exaggeration but just think of current fleet (of Navy, Air Force and Army), replacing it with petroleum-free one, all problems in logistics chain, and money required. The bad news is in 2030 we will be already in Post-Peak Oil era. Unless stated otherwise my data sources are: Defense Energy Support Center’s (DESC) Factbooks; EIA’s Annual Energy Outlooks back to 1996, The DoD Energy Management Reports; US General Services Administration Federal Fleet Reports; DOE’s Annual Reports to Congress found on DOE’s Federal Energy Management Program Website (FEMP); Inventory of U.S. Greenhouse Gas Emissions and Sinks (several years) of US Environmental protection Agency; publicly available briefings and presentations by military personal as well as military journals. Based on some 2.1 million active duty military and civilian personal. Jet fuel is used in aircraft and nonaircraft platforms, such as tanks, other ground vehicles, and power generators. Mobility here refers to tactical and non-tactical vehicles. DoD occupies over 620,000 buildings and structures worth $600 billion comprising more than 400 installations on 25 million acres in the United States (almost as big as the land area of Virginia or less than South Caroline and New Jersey combined). Non-tactical vehicles refers to passenger cars, vans, SUVs, trucks, buses and ambulances. 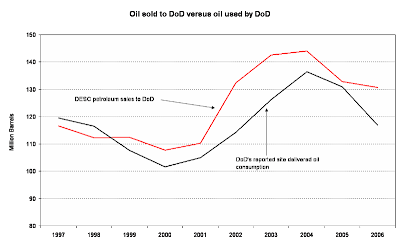 DESC charges its customers predetermined standard prices for fuels. Cost figures in FEMR corresponds actual prices. Milton R. Copulos, President of the National Defense Council Foundation , The Hidden Cost of Oil: An Update, January 8, 2007. Includes DoD owned as well as GSA and commercially leased. 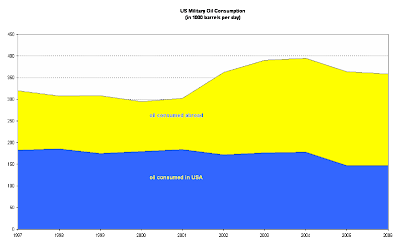 This corresponds to almost 2% of total U.S. oil consumption. For example, Kuwait supplied U.S. military forces entering into Iraq with fuel for their vehicles and equipment at no cost. Was it counted in the U.S. military oil consumption? O.K. DESC sells oil also to other federal agencies as well. But it is not 15 million barrels. 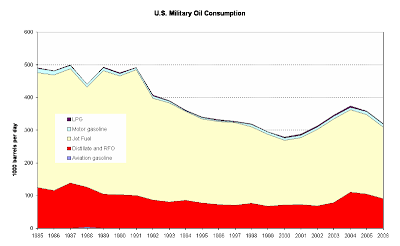 My figures for DoD consumption includes non-tactical vehicle’s oil consumption which is not included in DoD’s Federal Energy Management Report for FY2006. Gibraltar, Netherland Antilles and Singapore. For the period of 1964 to 1970. I do not take the deployed U.S. military troops to Thailand into account. Based on total employed troop level of 697,000 soldiers. Based on 145,000 troops level. I increased my June 2006 estimate of 40 kb/d to 50 kb/d today. Such as the recent LMI study entitled “Transforming the Way DoD Looks at Energy: An Approach to Establishing an Energy Strategy,” which I describe as Much Ado for Nothing. Scott C. Buchanan, “Energy and Force Transformation”, Joint Force Quarterly, 3rd Quarter 2006, pp. 51-54. Interview with Terry Pudas, acting Deputy Assistant Secretary of defense for Forces, Transformation and Resources, Defense News, January 22, 2007. See excellent reports of Ronald O’Rourke, such as RL33360 - Navy Ship Propulsion Technologies: Options for Reducing Oil Use — Background for Congress, Congressional Research Service, 11 December 2006, Or any other report authored by him. Speech of Michael W. Wynne to Air Force Energy Forum, March 8, 2007. Wow man, I have to say your blogs about the US Military and its oil use are amazing. Its inspired me to write about what the US Military could do to reduce its energy costs and fuel costs. Keep on writing, you've inspired me to write. When you say: "The DoD per capita energy consumption (524 trillion Btu) is 10 times more than per capita energy consumption in China, or 30 times more than that of Africa." You mean "524 BILLIONS"? I apologize for my mistake in DoD per capita energy consumption. The Unit should have been million Btu, and not trillion. Thanks a lot to the author of the comment above for pointing out the mistake. I corrected it in my article.